We took the opportunity a few years back to talk about the Best American Band question on July 4th. 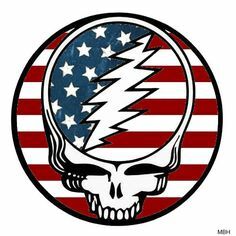 Now we are just giving you our answer in concert form, the Grateful Dead's July 4th 1989 concert. What a doozy! It is the perfect weekend to bust it back out as it is America's Birthday. Not many setlist surprises, just on point playing from the group. The second set starts with a great "Touch of Grey" before the reggae tinge of "Man Smart, Woman Smarter". "Terrapin Station" is always a welcomed 2nd set addition and RtBE are always a sucker for Brent's work "I Will Take You Home" just melts hearts. What better Encore for the 4th of July then "US Blue's"?